Qubiv is the PUP that uses misleading techniques to prevent removal. Use Reimage to locate malicious components and get rid of them faster than with uninstall instructions. A full system scan blocks virus reappearance and prevents traffic to malicious domains. What is there to know about Qubiv program? 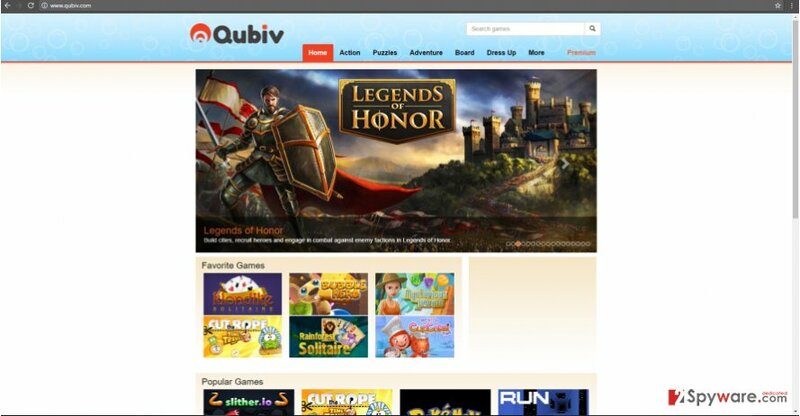 Popping gaming offers and advertisements might suggest that Qubiv virus has tiptoed into the computer. This adware-type program quietly settles on the PC and applies its specific code in the browser. This enables the PUP to display various advertisements and banners. Despite being them distracting, they also negatively affect your browser’s effectiveness. If you value fast browsing, remove Qubiv. This game-oriented adware tends to direct users to additional websites as well. Thus, it would be better not to delay Qubiv removal. Enjoy gaming online? While the majority of gamers immerse themselves into the virtual world of the League of Legends or Assassin‘s Creed, the Internet provides a divergent choice of mini-game websites. Likewise, qubiv.com happens to be one of them as well. Though these games might help you relax after a hard day, keep in mind that staying in such domain might cause unpleasant consequences. The longer the adware stays on the computer, the more Qubiv ads you might notice in the browser. What is more, they might appear at the most unexpected moment – while you are reading the news or chatting on Facebook. In relation to this, such ads frequently contain fake “Exit” button. By clicking it, you might get redirected to another gaming domain. Such Qubiv redirect becomes an irritating phenomenon. 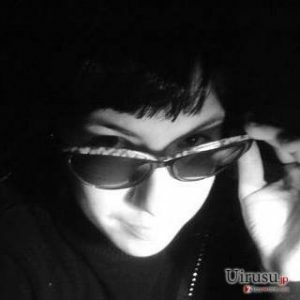 Because of this tendency, you might find yourself in insecure web pages as well. They might shelter various malware. For the safety of your computer, eliminate Qubiv. For that purpose, Reimage comes in handy. The PUP exploited the opportunity to infiltrate your computer when you recklessly installed freeware. Even Skype or the updates of Flash Drive might bring optional programs to your computer if you do not stop them on time. Likewise, Qubiv hijack occurs. If you are interested in preventing any adware in the future, use this advice. After initiating the installation process, opt for “Custom” settings. They will reveal any suspicious add-ons. Uncheck them and continue the procedure. pay attention while installing a new program so that you would not need to waste time dealing with unwanted tools. Here, look for Qubiv or any other recently installed suspicious programs. Wait until you see Applications folder and look for Qubiv or any other suspicious programs on it. Now right click on every of such entries and select Move to Trash. When in the new window, check Delete personal settings and select Reset again to complete Qubiv removal. Once these steps are finished, Qubiv should be removed from your Microsoft Edge browser. Here, select Qubiv and other questionable plugins. Click Remove to delete these entries. Now you will see Reset Firefox to its default state message with Reset Firefox button. Click this button for several times and complete Qubiv removal. Here, select Qubiv and other malicious plugins and select trash icon to delete these entries. Click Reset to confirm this action and complete Qubiv removal. Here, select Extensions and look for Qubiv or other suspicious entries. Click on the Uninstall button to get rid each of them. Now you will see a detailed dialog window filled with reset options. All of those options are usually checked, but you can specify which of them you want to reset. Click the Reset button to complete Qubiv removal process. This entry was posted on 2016-09-14 at 02:44 and is filed under Adware, Viruses. You can quickly scan the QR code with your mobile device and have Qubiv ads manual removal instructions right in your pocket. How did you remove Qubiv ads?